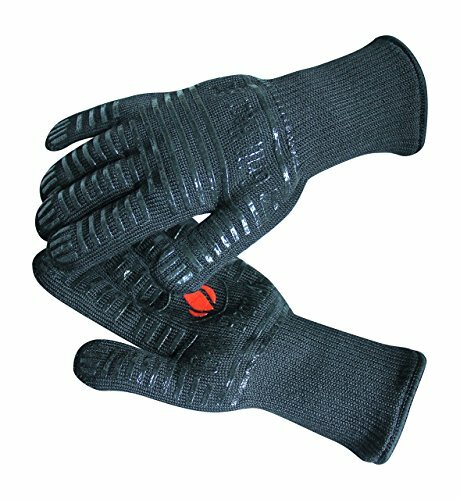 Each pair of our Extreme Heat Resistant gloves is EN407 certified, which means you're safe from flammability, contact heat, convective heat, radiant heat, even small and large splashes of molten metal. With protection up to 932°F, you're free to prepare meals with a full range of heat options. From intimate dinners, fireside roasts and backyard grilling to turkey frying, BBQ broiling and bread baking, our gloves can help you bring to life beloved dishes and recipes handed down from generations. Whether helping to prepare a roast or serving as the perfect wedding gift, our gloves are right at home wherever you and your loved ones are. We use para-aramid and meta-aramid fibers, the same material found in firefighter uniforms. These materials enhance our gloves by giving you the freedom to hold very hot cookware and utensils for a longer period of time. Many conventional gloves, mitts, & potholders are intended to hold these items for mere seconds, while Grill Heat Aid gloves keep you safe throughout your food prep. With ultimate protection at your disposal, you're free to work across virtually every form of heat cooking. This is the only pair of gloves you'll ever need to prepare filet mignon on the grill, chicken on the rotisserie, wings in the fryer, cobbler in the oven, and much more. Our flexible design enables you to handle every pot, pan, skillet, sheet, and utensil securely. We've designed your Extreme Heat Resistant gloves to perform with excellence, reliability, and safety for years to come, wherever you need them, whatever the cook source. If for any reason you're not thrilled with their premium build and quality, remember that you're covered by our lifetime warranty. Contact us with any concern and we'll refund or replace your gloves on the spot. INDOOR & OUTDOOR USE: Our mitts can be used for whatever wherever whether that's indoors keeping you safe while making your significant other by cooking them an intimate meal. This allows you to focus on cooking rather than worrying about hurting yourself. Which then makes your partner happy meaning you will be happy. The Gloves can also be used outside on the BBQ such as on 4th of July making sure your celebrations don't get cut short from burning yourself. GUARANTEE: From over 2000 overwhelmingly positive reviews our gloves not only amaze us but we're more than confident that they will amaze you with their high grade professional feel. If they do not live up to your expectations then we can offer you a full refund. If you have any questions about this product by Grill Heat Aid, contact us by completing and submitting the form below. If you are looking for a specif part number, please include it with your message.